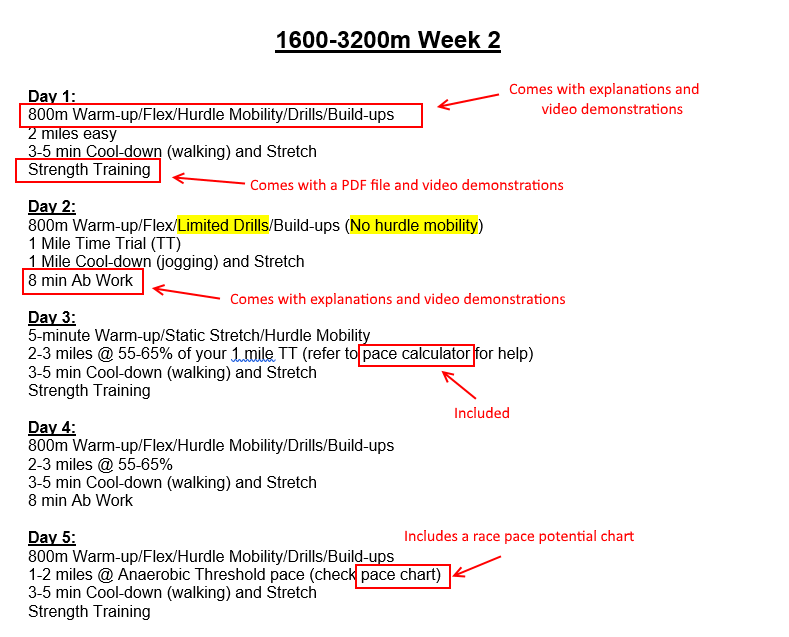 Looking to improve your mile and two mile time with a quality mile and two mile training program? Well look no further. 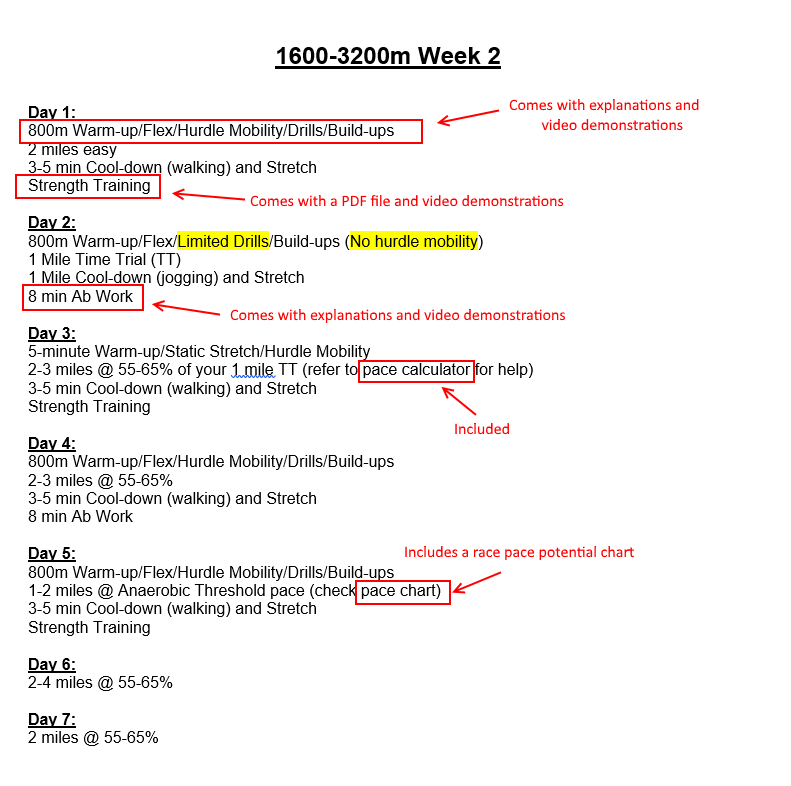 My name is Scott Carhoun and I have developed a 12-20 week mile/two mile training program that is easy to follow and includes a training schedule, a strength training schedule, demonstrational videos, and explanations that clearly explain what track workouts and strength workouts to do and how to do them. When you purchase today, you will get immediate access to a mile/two mile training program that will surely help elevate your track and field training. No CD’s, no shipping, no waiting…it’s all digital! If you were not satisfied with last season’s mile or two mile training and you let opportunities slip by, then maybe this is your lucky day. In my mile/two mile training program, you will learn how to reach your potential with proven workouts and strength training that are designed to improve your performance and get you where you need to be when it counts. My mile and two mile training program is great for all track and cross country athletes of all abilities (including elite level athletes). It is designed with workouts, exercises, and intensity ranges that are based on percentages of what you can do instead of pre-determined times someone else can do. With the performance tests designed specifically for you, you will be able to monitor your progress and gain confidence as you will be able to test multiple times throughout any of the 12 week, 16 week, or 20 week training programs. My mile/two mile training program is versatile and can be used for more than a means to get you your fastest mile time in 12-20 weeks. You can also use this training program to prepare for basic training and/or use any of the workouts for off season, summer, and winter training. The goal with the mile and two mile training program is to challenge you a little, then a little more, then a little more, and then a little more. With this training principle, the idea is to allow you to improve your performance with each challenge rather than fully submerge you into a state of fatigue, because if you did that, then you would improve very slowly or even worse, not at all. You can expect to have a wide variety of mile specific workouts that are designed to prepare you to run a solid mile and two mile in 12-20 weeks. The workouts in this training program are not impossible but they are no walk in the park either. As mentioned before, the workouts are based on percentages of what you are capable of based on the testing throughout the training schedule. I have also included training notes in the form of FAQ’s to help you understand your training schedule. It’s real simple. If you are looking at the training schedule and are confused about something on it, all you have to do is review the notes and you should be good to go. My mile/two mile training program is designed for any athlete who is interested in taking their athletic abilities to higher levels. Whether you are in junior high, high school, college, part of a club team, or even preparing for basic training, they are designed to help you reach your potential. When we think of the mile and the two mile, we think “distance event” or “middle distance event”. No matter what we call them, running a fast mile and two mile is more than just a bunch of long distance runs. In the mile/two mile training program, you will have access to a combination of workouts that will challenge the five bio-motor abilities such as speed, strength, endurance, mobility, and coordination. The mile/two mile training program will also improve your aerobic and anaerobic abilities to “race” and not just “run”. In order to prepare a miler or two miler in 12-20 weeks time, the kind of workouts you can expect to be involved in this training program will develop running speed, strength, aerobic and anaerobic capacity, mobility, coordination, and aerobic power.